BIRTH: About 1599, son of Henry and Margaret Howland of Fenstanton, co. Huntington. MARRIAGE: Elizabeth Tilley, daughter of John and Joan (Hurst) Tilley, about 1624, at Plymouth. DEATH: 23 or 24 February 1672/3 at Rocky Nook, Plymouth. John Howland was born about 1599, probably in Fenstanton, Huntington. 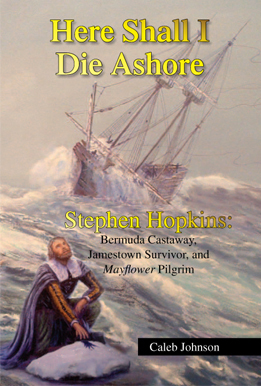 He came on the Mayflower in 1620 as a manservant of Governor John Carver. 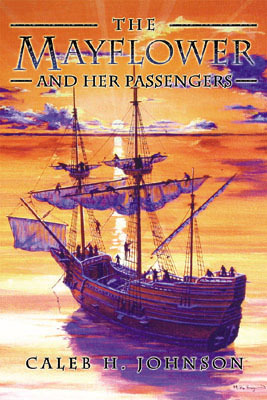 During the Mayflower's voyage, Howland fell overboard during a storm, and was almost lost at sea--but luckily for his millions of descendants living today (including Presidents George Bush and George W. Bush, and Mrs. Theodore Roosevelt) he managed to grab hold of the topsail halyards, giving the crew enough time to rescue him with a boat-hook. 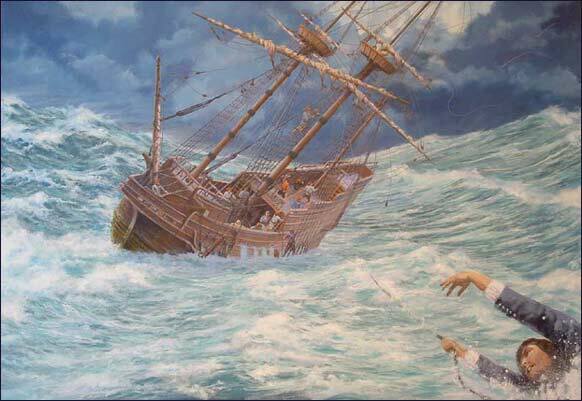 "Howland Overboard," a painting by maritime artist Mike Haywood. 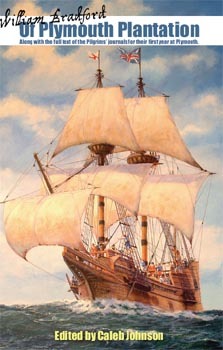 Giclee canvas prints are available from the MayflowerHistory.com Store. It has been traditionally reported that John Howland was born about 1592, based on his reported age at death in the Plymouth Church Records. However, ages at death were often overstated, and that is clearly the case here. John Howland came as a servant for John Carver, which means he was under 25 years old at the time (i.e. he was born after 1595). William Bradford, in the falling-overboard incident, refers to Howland as a "lusty young man," a term that would not likely have applied to a 28-year old given that Bradford himself was only 30. Bradford did call 21-year old John Alden a "young man" though. Howland's wife Elizabeth was born in 1607: a 32-year old marrying a 17-year old is a relatively unlikely circumstance. Howland's last child was born in 1649: a 57-year old Howland would be an unlikely father. All these taken together demonstrate that Howland's age was likely overstated by at least 5 years. Since he signed the "Mayflower Compact", we can assume he was probably at least 18 to 21 years old in 1620. The Jabez Howland house in Plymouth was built about 1667. John and Elizabeth Howland lived with their son Jabez in this house during the winters, and Elizabeth also lived their after the death of her husband in 1672. The Howland family burial plot on Burial Hill in Plymouth. Stone memorial marking the spot of John and Elizabeth (Tilley) Howland's homesite in Rocky Nook, north of Plymouth. The Pilgrim John Howland society owns the land and archaeologists have worked the site each summer for a number of years.